We’ve been experimenting with signage down at the garden for almost three years now. I think we’ve finally hit upon a good solution that will hold up well through all seasons—we are using rocks and concrete. An example of our new signs is shown above. This one is for our bean patch, which will feature Fort Portal Jade, Purple Hull Pinkeye, 1500 Year Old Cave Bean, Gold Marie Vining, Blauhilde, Pigeon Pea, Jacob’s Cattle (all grown from rare heirloom seeds) and speaking of beans . . .
Have you heard of John Withee (1910-1993)? He grew up in rural Maine. Every Friday his family chore was to clean out the bean hole and start a fire in it. This pit in the Withee’s backyard was used an earth oven. When the coals in the pit got hot, a Dutch oven was placed in the coals and then dirt piled over it. The beans baked in the pit for an entire day. Then they were eaten for the Saturday evening meal. Leftovers were eaten on Sunday. If there were any remaining beans from Sunday, they would be spread on bread with mayonnaise and eaten for school lunches. After living in crowded urban areas with little yard space for years, in the early 1970’s, Mr. Withee moved to a place in Massachusetts where he had a little land. Thus he decided to create a bean hole in his backyard and invite a few of his friends over for a “bean bash.” According to John Withee, the best beans for baking are called “Jacobs Cattle.” As things turned out, he could not find any beans of this variety so he had to substitute a less desirable variety. It was this event that stirred his interest in seed saving and became what was to be a 20-year quest for different varieties of beans. He amassed nearly 1,200 varieties of beans and formed an organization called ‘Wanigan Associates”—a network of bean growers who helped him maintain his collection of 1,186 species of beans. The entirety of Withee’s collection of bean species today is at Seed Savers Exchange’s Heritage Farm in Decorah, Iowa. Seed Saving and Sharing is important. Seed savers are interesting and important people. The lives of many varieties of our edibles are in the hands of a very few gardeners. Since the late 19th century, it is estimated that 95% of what was once available disappeared and took its genetic code with it. Few plants are more important to our world than the bean. In view of its importance, the United Nations declared 2016 as the International Year of Pulses. Pulses are dried beans. This food source makes up the protein for ¾ of all the people on the planet. 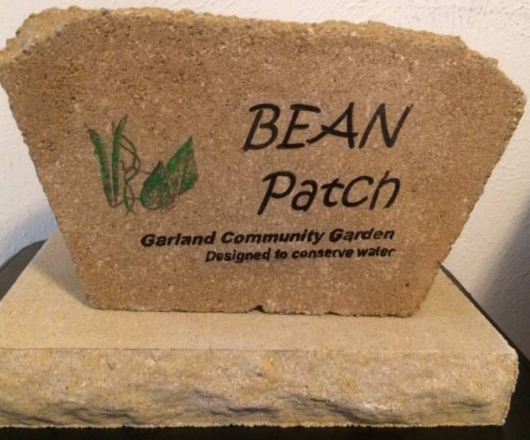 In tribute to beans, we are devoting an entire garden plot to them at the Garland Community Garden. You Can Save and Share Seeds! You can join concerned gardeners from all over the world who are seeking out antique or endangered species of plants and trading the seeds with other growers so that those varieties can be kept alive. 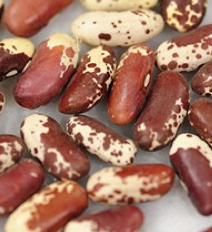 Here are some links to a few sources for rare heirloom seeds. Obtain some, grow the variety, and then share your seeds! It’s fun. Yes, hugelkulturizing is a verb I possibly made up. It may not have ever been used before but the grammatical potential, at least in English, has always been there. Hugelkultur (noun) is a German word that literally translates “mound culture.” It refers to a type of bed preparation that makes the bed especially water efficient. It emulates the natural transition in a forest: leaves fall, trees fall. Over time the logs and leaves rot and release nutrients to feed the growth of new trees. The logs become like sponges and hold water that roots may seek when the weather gets dry. To build a hugelkultur, a pit is dug and rotten logs are placed in it. Some also simply place the logs on top of the soil and then pile the organic matter on top of that. The benefit of digging a trench is that the mound will not be so high. 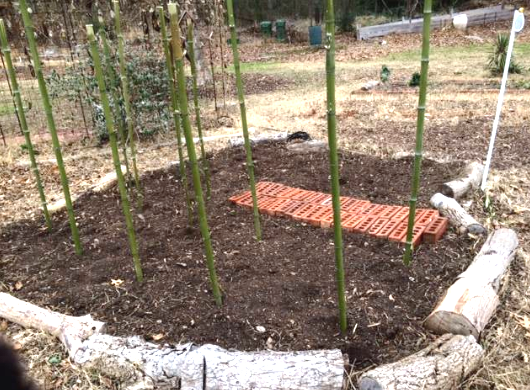 Yesterday, I joined Jane Stroud, President of Loving Garland Green and Burgi Bartlett, board member, to hugelkulturize existing beds down at the garden.Jane and Burgi put about eight rotten logs in the bottom of our keyhole garden and then assisted me in finishing up the bed that will be our bean patch this year. Jane Stroud, President of Loving Garland Green , and Burgi Bartlett, Board Member, hugelkulturize the keyhole garden. 1. Soak already decaying logs in water. 2. Dig a trench at least six inches deep. 3. Put the logs in the trench. 4. Cover with organic matter such as leaves. You can also add decaying veggies from your refrigerator. 5. Cover with soil. You will have created a little mound six inches to a foot high. You don’t need to plant on the mound if you don’t want to. The roots from nearby plants will seek out the nutrients that seep down. I’ve been busy the last week designing a compost course that I’ll be presenting to third graders at Watson next Wednesday. Composting is about much more than a technique for crazy gardeners like me. Composting is in part about raising consciousness regarding the food that we waste and then taking action to correct our part in the larger picture of things. In 2012 an alarming report released by the Natural Resources Defense Council revealed that as much as 40% of the food that we are growing, raising, and cooking gets thrown away. 1. We can throw it in the trash and it will get shipped to our landfill. 2. We can put it down the garbage disposal and it will go to our water works. What happens to it there depends upon the system our municipality has set up for dealing with this kind of waste. Sometimes it is recycled for good use. 3. We can compost much of our food waste. 4. We can become wiser shoppers and only buy what can be used and/or frozen for use at a later date. January is the month that gardeners pour over their seed catalogs and dream of spring. At our meeting on Monday, January 16, we will be selecting 100 packets of heirloom seeds to order. These seeds will be used in the garden and we will be selling or perhaps giving them away at our annual plant sale in April. Members will also be able to take as much as they can use in the gardens in their yards. Charlie and I have already ordered ours separately. 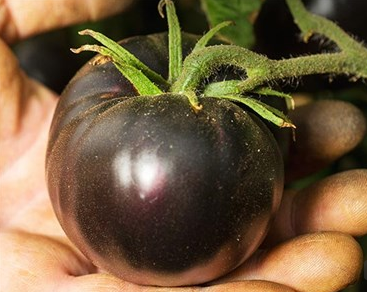 The black tomato featured above is one that he has chosen for his garden. We will also be painting garden rocks. Each person will be able to take one rock home and the other rock will be donated to our sale. In preparation for this RSVP event where members will be painting rocks at my house, I’ve been practicing myself and experimenting with various techniques as I’ve never painted a rock. Armed with this limited knowledge, I won’t be painting rocks at the event. Instead I’ll be helping people who want tips on how to do it—no unsolicited advice from me, I promise. Speaking of learning by doing: yesterday I mulched three large bags of leaves to be used as part of the demonstration for my compost class. Intellectually I know that often when something is chopped up, it reduces the volume (the amount of space it takes up). However, I was really impressed at the extent to which the leaves were reduced. Three large, completely full bags of leaves after mulching filled up a little less than half of one bag. Even if you think you have too many leaves to deal with, you may not if you mulch them. Think this way: Six bags = one bag the same size. Then ask your servant to mulch your leaves and spread on your lawn and garden beds. Leaf Mulching Is the Answer! 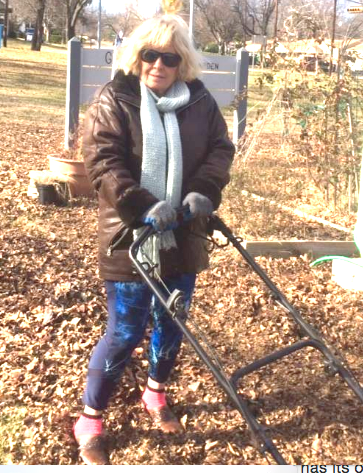 Charlie captured me following my own advice--in this instance, mulching leaves down at the Garland Community Garden! Sometimes Solutions Can Be Simple! Honest, I usually try out methods in the garden before I recommend them to others. I've been intending to get down to the garden and mulch all those leaves we have been strewing everywhere for the past month. Today I finally got down there and mulched all the leaves in the front of the garden. If the weather holds out with no precipitation, I'll mulch the rest of them tomorrow. It's fun to watch leaves turn to almost dirt. You can purchase a mulching blade for most lawn mowers. Charlie already had one for his Toro lawn mower so I just borrowed his. However if anyone wants to donate a zero turn leaf mulching machine for the garden, I would be happy to accept it! 1. Those "unsightly" leaves disappear into the soil. 2.After three years of mulching you will no longer need to apply herbicides to your lawn to kill weeds such as dandelions. 3. You can save money and the environment by reducing the amount of fertilizer you need to keep your lawn healthy. Is mulching your leaves a totally environmentally sound solution? No. I am still using a gas-powered piece of lawn equipment. 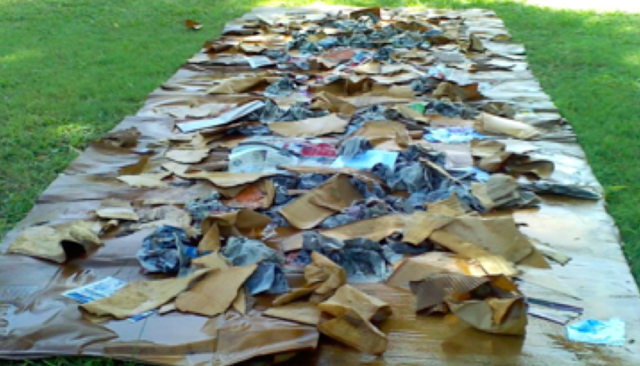 However, when measured against bagging leaves in plastic and hauling them off to the landfill in a gas guzzling truck, mulching leaves that fall in your yard is a better solution. Get out there an mulch those leaves! Don't sentence them to the landfill! Let's hear it for Leaf Mulchers! Don't Bag Them! Don't Rake Them! MULCH THEM! Instead of raking leaves and putting them curbside, save yourself time, energy and money. Mow your leaves with a mulching mower. If you have a servant who does your yard work for you, ask them to use a mulching mower. This is also a business opportunity for Lawn services. A mulch mower reduces the labor intensive and time-consuming work of raking and/or blowing leaves and also the expense of plastic bags to hold them. You can advertise your company as "eco-friendly"--always a plus these days as more people are waking up to the relationship between a clean environment and their health. You don't have to worry about what your neighbors will think. The tiny brown bits of leaves fall down through the grass and are not seen. After a few years of mulching your leaves, you won't have to worry about dandelions. There! You can even stop paying the pesticide man to douse your lawn with chemicals--most of which end up either polluting our groundwater or being carried out with the stormwater runoff to pollute our streams. The decomposing leaf bits cover the ground in between the grass plants and prevent weeds from growing. A Michigan State University study found a decrease of almost 100% of dandelions, crabgrass, and other weeds in lawns after only three years of mulching. 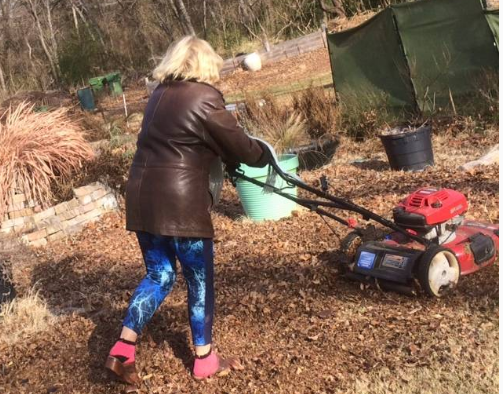 Can you use a regular mower to mulch leaves? Yes, you can but it won't be as efficient as a mulching mower. Unlike regular mowers, the mulching blade of a mulching mower spins leaves and grass more than once to cut it into very tiny pieces. If you use a regular mower, set it to a high setting and mow the leaves without a bag attachment. The pieces will be larger, but clearly that would be preferable to having un-mulched leaves on your lawn. Won't mulching contribute to thatch build up? NO! Thatch is formed when roots, stems and leaves of grass build up faster than they decompose. Proper mowing, irrigation and fertilization will prevent thatch buildup. Over-fertilization is the primary culprit for thatch build-up. You can purchase a mulching mower at just about any hardware store that sells garden tools and supplies. The price for these mower is about in the same range as the prices for a regular lawn mower. If you have a lawn service, make sure the equipment they use for mulching leaves is indeed a mulching mower (or is a regular lawnmower that is fitted with a mulching mower blade). The best way to tell is to look at the size of the pieces of leaves mulched by the mower. The pieces should be tiny enough to quickly disappear down into the soil of your lawn. Pole Bean Bed To Be - By the end of May these poles will feature beautiful leaves and green beans. Members of Loving Garland Green are excited about the upcoming year at the Garland Community Garden. Already in these very first days of the new year we’ve seen a lot of interest expressed regarding the garden and have received many requests on the "Contact Us" section of our website at lovinggarlandgreen.org. People are interested in working with us to increase the number of residents in Garland who grow some of the food they eat. Like us, they know that such activities grow our local economy and increase the food security of our community. There has been an overwhelming response to our November Leaf Awareness campaign—in fact, it seems to have no end. 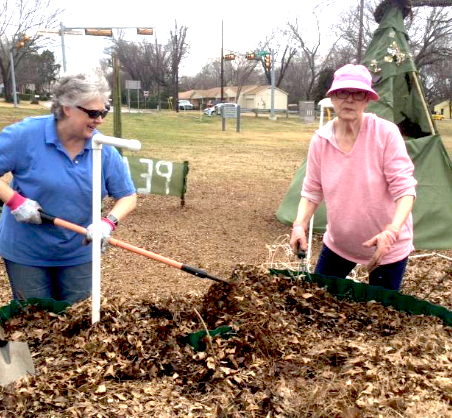 Residents throughout December and now moving into January, continue to drop off bags of leaves at the Garland Community Garden. Until we began our campaign, all Garland residents we asked mistakenly believed the leaves they left curbside were composted. This is not the case. Leaves left curbside in Garland are taken and deposited in the Hinton Landfill. We are happy to report now that citizens know better, they are taking actions to divert their leaves from the landfill. The best solution for leaves is to compost them as near as possible to the place where they fall. Composting leaves in your yard saves on fuel, wear and tear on our roads, reduces air pollution and provides other benefits as well—such as cost savings for soil amendments that are needed. 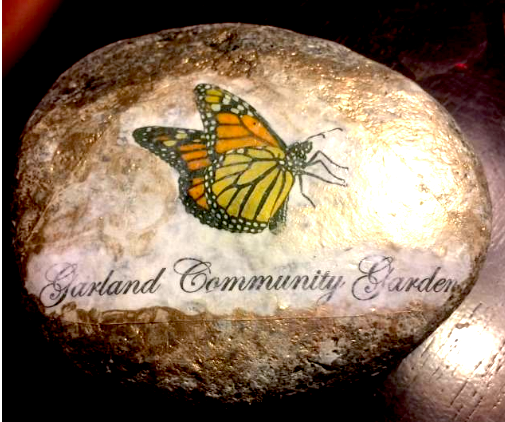 From its very inception, the Garland Community Garden has relied on the bounty of leaves in Garland to create and enrich the soil in our garden. The property we steward was once a residential area. Here and there one will find leftover foundations and driveways. Instead of digging down to create our beds, we have built most of our beds up, on top of the existing soil and other things nonorganic such as concrete. The method we used is often referred to as "the lasagna garden bed." It is created by layering organic materials: Begin with a weed barrier of cardboard. Then crumple wet card board and newspaper on top of that. Pile a layer of brown organic matter such as leaves. On top of the dry leaves put a layer of green organic matter such as trimmings from shrubs or uneaten vegetables from your refrigerator bin. Water well between each layer. Top of with a 4 inch layer of garden soil and compost. These beds usually take a year to mature. At first they will be about 18 inches to 2 feet high, but over time as the matter decomposes into rich soil, the bed will end up being about 6 to 8 inches high. 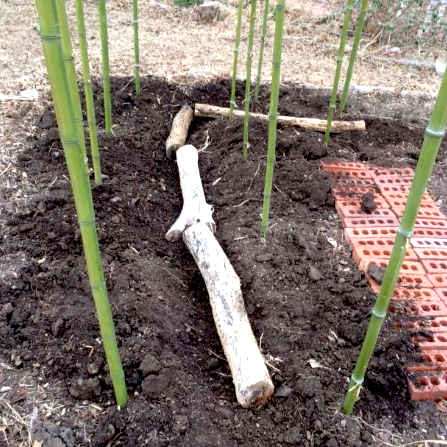 In the past year we have been following the hugelkultur method for building our beds. In fact, we are also using that method to amend our existing beds. To do this we dig down to the bottom of the existing bed and insert rotten logs that have been soaked in water. These logs provide time released nutrients to the bed as they decay. In addition, their spongy surface holds water and provides needed moisture to the plants growing above it. Proponents of this type of garden bed say that it is ideal--especially for drought prone areas. Some claim that, except in cases of extreme drought, these beds require no additional water other than rainfall and no added fertilizers. NOTE: The City of Garland offers a composting class twice a year: in the spring and in the fall. Call 972-205-3500 for more information about these classes. Recent Fire at Plano Recyclable Facility Reinforces the Value of Diversity in Choosing vendors for City Services—particularly when it comes to choosing those who deliver critical services such as trash/recyclable removal. The tendency in selecting city services all over the USA seems to follow a big box Wall Street Corporate way of thinking as opposed to favoring diversified local services: Perhaps city planners need to revisit this way of doing business. First of all we need to consider the value that local businesses provide the local economy in which they operate. It’s a well-known fact that much more of the money earned by a locally based company stays and is re-circulated in the local community than the money earned by a multinational corporation providing the same services in that community. Source: Civic Economics – Andersonville Study of Retail Economics. Republic Services, the one vendor who handles all the services for picking up recyclables for Richardson and Plano is a huge multinational corporation that operates worldwide. According to the hype on their website, they provide “dependable solutions for your recycling and waste challenges.” It may be more economical and rewarding for the bottom line for their investors, but I think it’s neither responsible nor dependable to have only one recycling station to handle the recyclables for residents of two cities with combined populations of 378,884, which appears to be the setup they engineered for the cities of Plano and Richardson. Now, as a result of one fire, all the recyclables will have to be hauled to the landfill until that point in time when Republic can be up and running again. To measure up the economies of having the multinational corporation Republic deliver services, the City of Plano will need to figure in the cost of diverting all these recyclable goods to their landfill. And as mentioned before, to figure the real “value” of Republic, the city needs to figure the cost of the extra $25 out of every $100 paid to Republic that does not stay in the local community. Now many will say: “But there is no local company who can offer such services.” No, but there are likely several local haulers who could step up and form a cooperative to manage the job. Perhaps this is a good opportunity for the Small Business Administration and local Chamber of Commerce to step up to the plate and assist folks in creating local business solutions in their community. Plano is not the only USA community who choose multinational corporations over local businesses. In fact, most of them do. This all reminds me of a similar situation a few years ago, under a different Mayor here in Garland when our government leaders chose Pepsico, a multinational junk food manufacturer to deliver summer lunches to children in our community. I protested at the time saying that several local caterers could have handled the job. We all need to turn our minds to local because locally chosen business serve our local economy much better than multinational corporations. How long will it be before we learn this lesson? It will be interesting to see if the leaders of Plano have learned from this incident. If they simply allow Republic to repair its existing facility and go forward as before, I would have to say they’ve learned nothing. Again the real value of choosing a multinational corporation over several local vendors for the job should always include the 25% loss of any dollar amount paid to a multinational corporation over a local business. Twenty-five percent is fairly significant and should always be figured into the cost of doing business outside the local community.